Walk into any department store or even grocery store and you’ll often see what looks like a modern vertical juicer on sale for incredibly cheap prices. They look almost identical to the premium name-brand model. So what’s the difference? The first thing to consider is the country of origin. Almost all „cheap“ juicers are made in China, where there is a huge industry of quickly copying and cheaply duplicating the latest premium models. 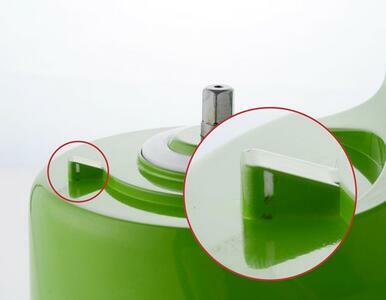 If you look on the bottom of the juicer, you will see the country of origin. The well-known high-quality brands are generally produced in South Korea, which has a very high standard of quality both in materials and labor. If you see „Made in Korea“, it is safe to assume that it is a well-made juicer. If you see „Made in China“ or more likely „Made in PRC“ (People’s Republic of China) then it is likely a copycat clone made quickly with the cheapest possible materials and rushed to market. Of course, one can’t simply dismiss all Chinese products as being of low quality. Many high-quality well-known brands export products from China. Manufacturing there is cheap, extremely fast, and flexible. However, keep in mind that many products that are assembled in China are made from components sourced from other countries. For example, iPhones are assembled in China, but most of the parts come from South Korea and the USA. How is it possible to sell a juicer so cheap? If you compare a name-brand juicer with a copycat, it is obvious by the feel and the weight that they are made of much lower-quality materials. Turn it on, and it’s common to hear a louder or badly vibrating motor. The fit and finish are also of much lower standards, meaning parts do not seal together tightly or rattle while in use. This can make juicing more difficult, especially after a few months as the vibration causes the parts to have even more trouble fitting together and the pressures experienced from the juicing process strains the cheap assembly. 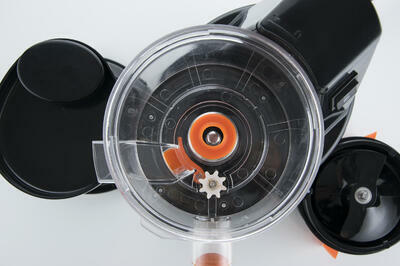 This juicer looks just like an Omega or Hurom from the outside, but take it apart and the differences are apparent. The poor-fitting orange gasket caused leaking onto the motor housing, and the flimsy white plastic gear had got jammed with carrots, causing a high amount if pulp to back up into the juice. This „colorful“ juicer shows that beauty is only skin deep. Rather than being made from colored ABS, it’s just a cheap paint job on plastic. Note the way the juicing screen is attached to the frame. Juicing screens are subject to very high levels of pressure, especially from hard vegetables, and are often the first thing to break. A common place to save money is in the motor. High-quality juicers use strong AC motors designed for years of use. Often the copycat models have the cheapest DC motors which aren’t really suitable to provide the torque needed, especially over time as the gearing systém to reduce high-speed DC motors to a slow speed suitable for juicing creates excessive heat and puts a strain on the motor. That is why motors, along with juicing screens, are usually the first thing to fail in a DC motor juicer. This is also reflected in the warranties, which are almost never beyond the required 2 years, and usually come with a lot of fine print to protecct the manufacturer from claims. 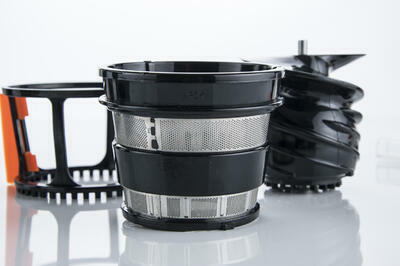 Name-brand juicers have long warranties and long life cycles. This means that replacement parts are readily available. Typically a copycat factory will produce a model for no longer than six months, and then move on to the next model to be copied. Spare parts are not a consideration, as models are rapidly changing and the factories are constantly retooling. 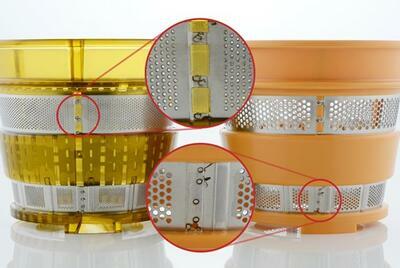 Be careful to check not only the warranty of an off-brand juicer, but also the availability of replacement parts. Also read the fine print in the warranty. Customers are often surprised when they find out that a claim is rejected due to what would typically be considered normal wear and tear from established companies. We recently purchased an off-brand juicer to try it out, and noticed that „filters“ (aka the juicing screen) are not covered by the warranty. This is probably the first thing that will break on a cheap model. Check out verified reviews on big shopping websites and you will often see reviews that are initially positive but are later updated with disappointed comments saying their juicers only lasted a few week or months until breaking, and that the company never responded tocalls for help. Often when a juicer with new features comes out, the first models are purchased by Chinese engineers who quickly disassemble it and duplicate the parts with cheap plastics. Factories are quickly retooled and sometimes within just a few months those „new“ or „exclusive“ features are on 5 different cheaper models, sold under various unknown brand names. The copycats had no research or development costs, except for the person who dissassembles and copies the parts. Most name-brand juicers are made with high-quality materials and are CE certified – meaning they meet the safety standards required by the EU. You won’t always find that on cheap copycats. Also, trustworthy models usually use BPA-free materials in all their plastics. This is not a typical feature of cheap juicers, meaning toxic materials could potentially leach into your juice. Note the "PC" label molded into the juicing screen. This stands for poly-carbonate plastic, and it contains BPA. Almost all quality juicers are produced in South Korea. The standards and technologies used there are very high. The Korean factories work hand-in-hand with Western brands to ensure quality production and availability of replacement parts. It is true that some of these manufacturers work with Chinese production facilities, but in this case they oversee all aspects of the producion. Brands such as Omega, Sana, Oscar, Kuvings, Hurom, Green Star, Angel or Kempo are more expensive, but the price reflects the many benefits. These include quality construction, strong motors, great performance, availability of replacement parts, quality customer support, safety, and the availability of service centers. Better yet, you can read the reviews of these machines to see the stark contrast with the copycat machines. The saying „You get what you pay for“ certainly holds true when it comes to juicers.